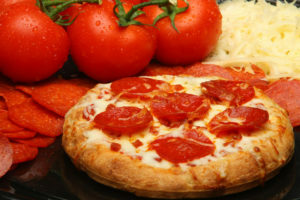 095033- Each 9.80oz Serving of 7″ Self-Rising Pepperoni Pizza provides 2.00oz. equivalent meat/meat alternate, and 1/8 cup vegetable for the Child Nutrition Meal Pattern Requirements. DISCLAIMER: This product contains grains that are not creditable in school meal programs. Additional grains must be served to meet meal pattern requirements.